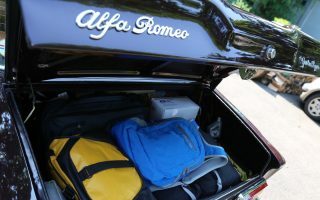 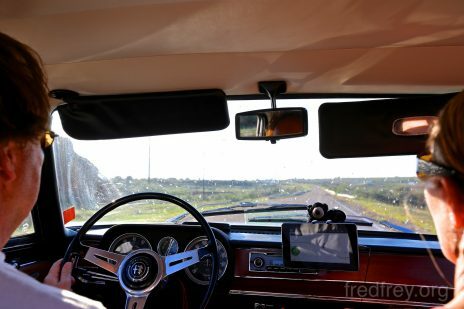 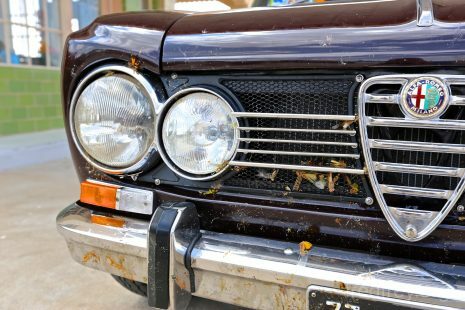 We are now joined on our trip by Neil and his 1981 Spider. 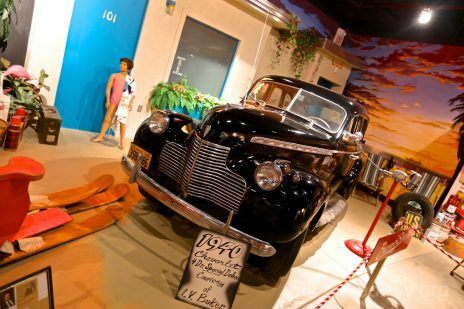 Thanks to google latitude he was able to track us from New Jersey and catch us as we waited for a museum to open. 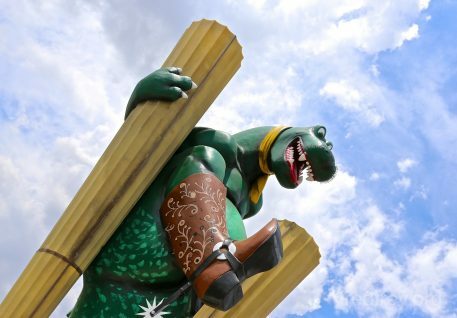 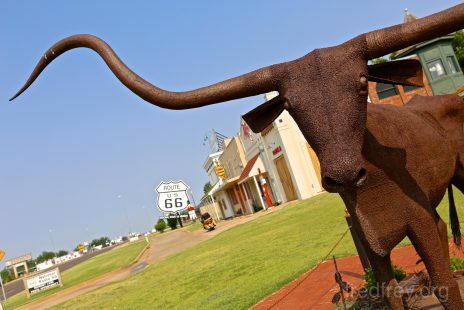 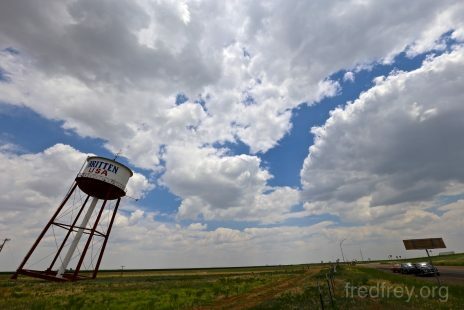 As Elk City was so close to the Texas border we were eager to don our cowboy boots and hats and see the Lone Star State. 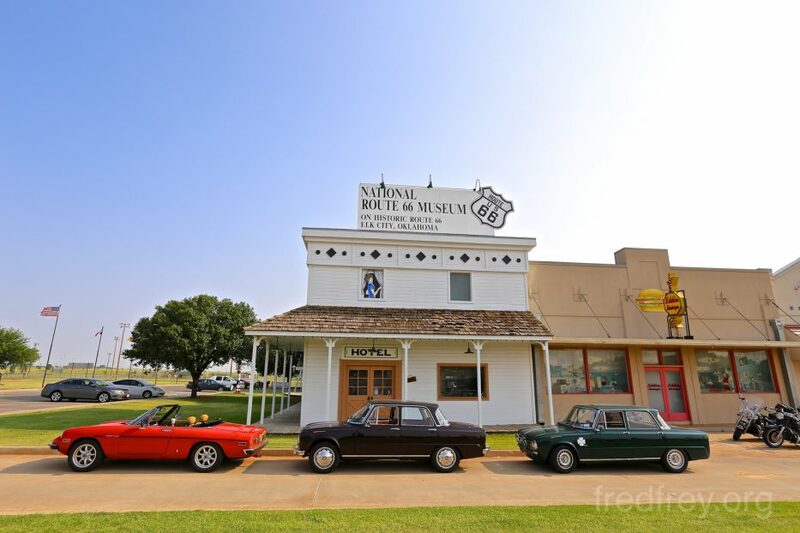 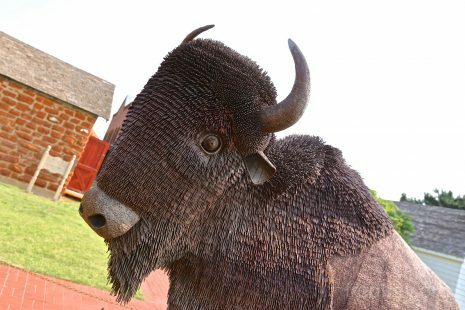 But first we had two more stops in OK. Fist was the National Route 66 Museum. 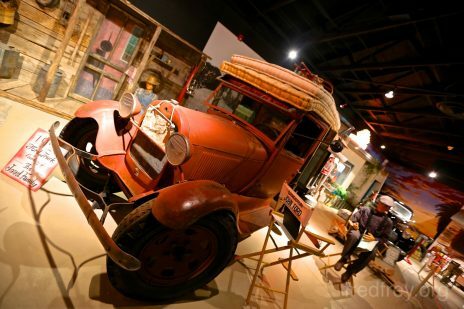 This museum is acutely a collection of three museums – but truth be told; they all are quite rubbish. 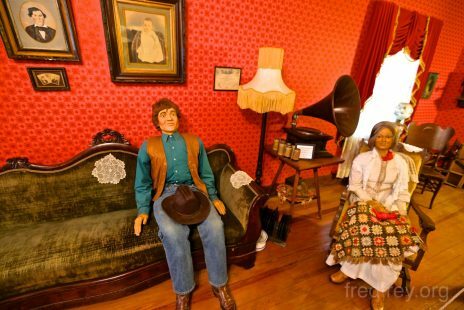 The most memorable aspect is how strange the mannequins looked as they were placed in the various old homes that were set up to look like a trip back in time. 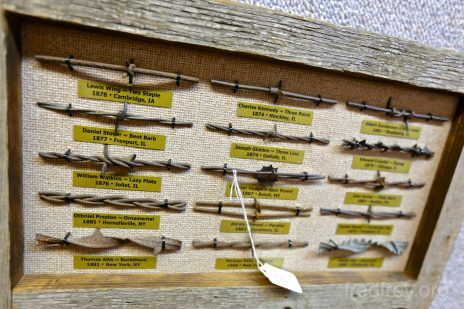 Red Oak was much more authentic. 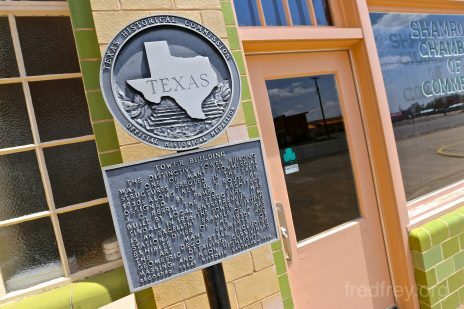 Just before the border into Texas is the town of Texola – or was. 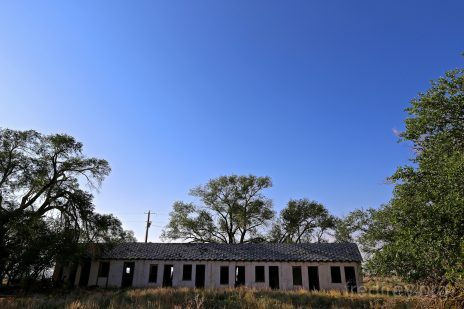 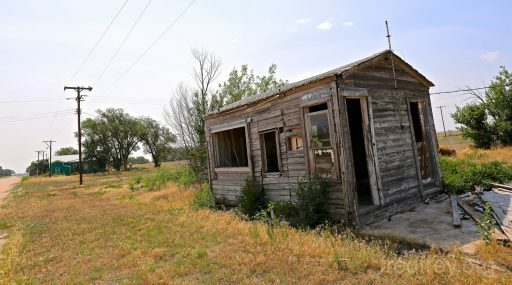 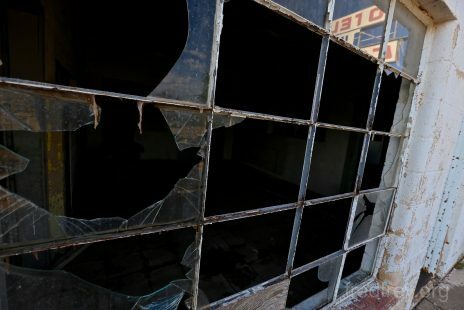 This is one of the several “ghost towns” we’ve picked out to visit. 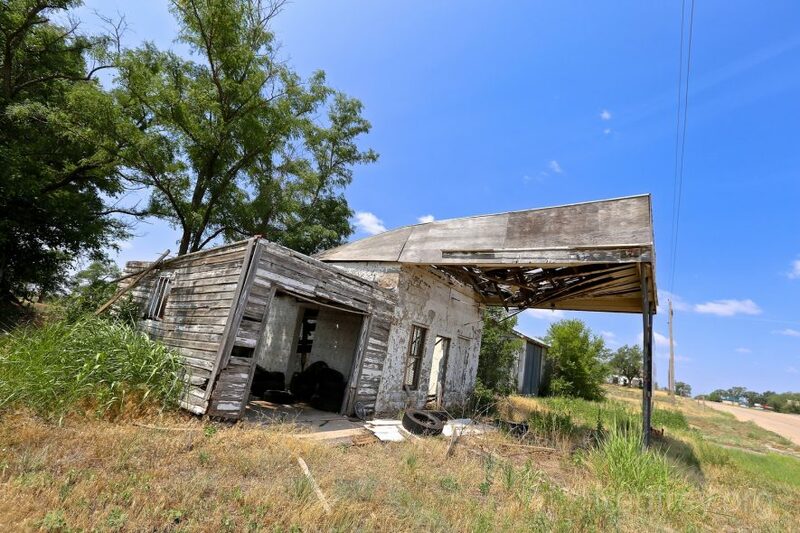 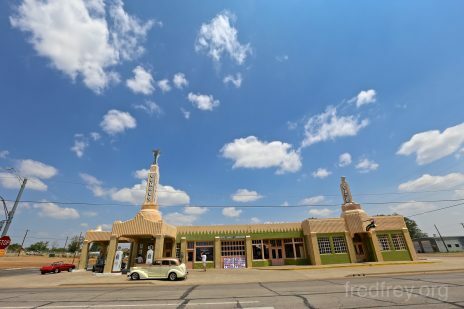 This collection of crumbling gas stations and homes is quite depressing and beautiful at the same time – and no charge to visit! 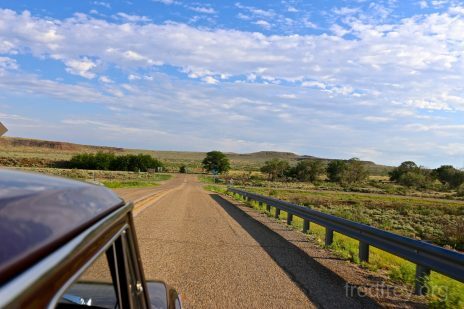 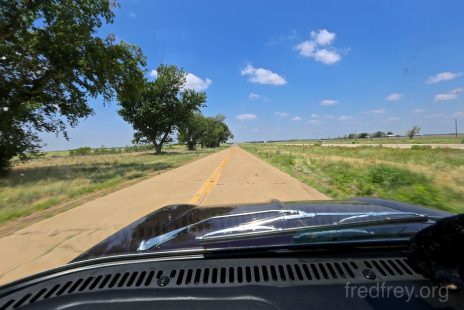 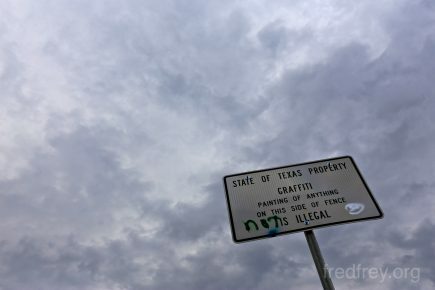 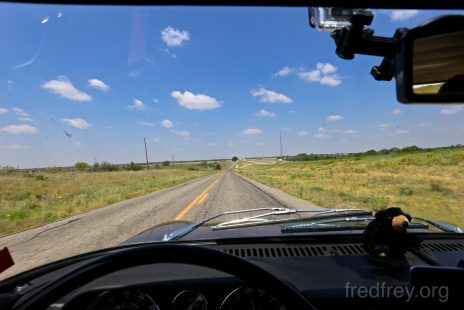 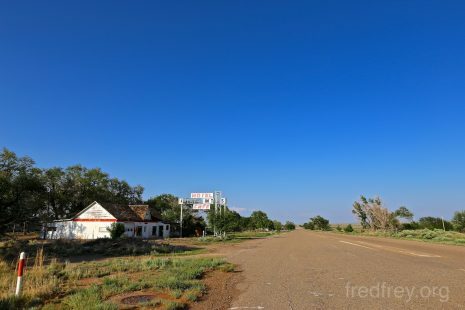 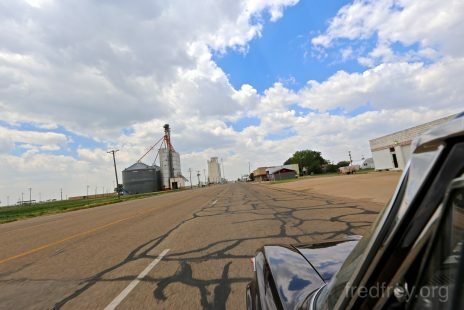 As we entered Texas, the actual Route 66 road surface in this area is quite similar to what we found in western OK. A strip of cement and in pretty good condition, hugs the north and south sides of the interstate that we happily view from our empty “private” road. 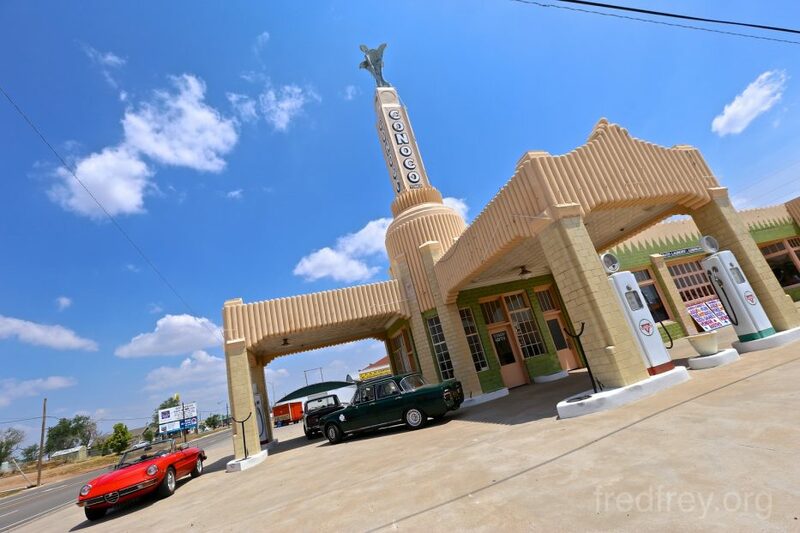 The Art Deco Conoco tower is a must see stop among travelers of 66. 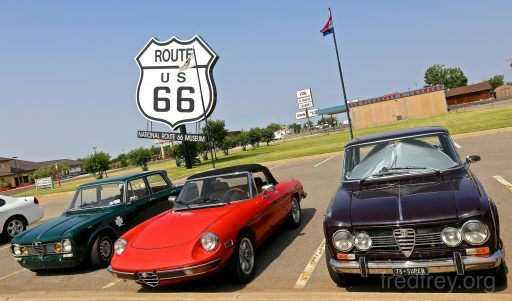 We took a few moments to pose for photos as well as say hello to another follower of the route heading east. 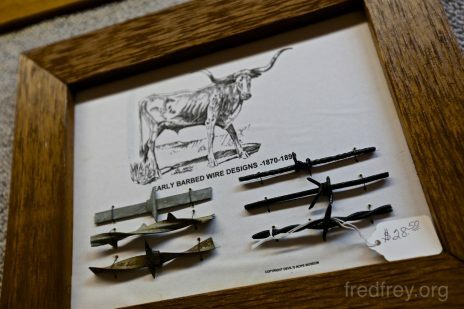 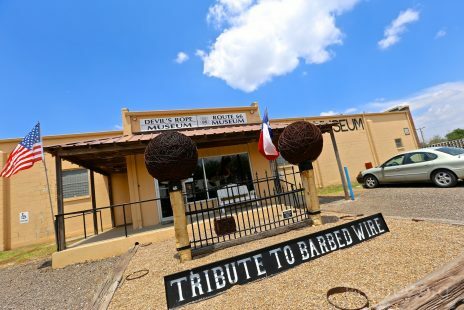 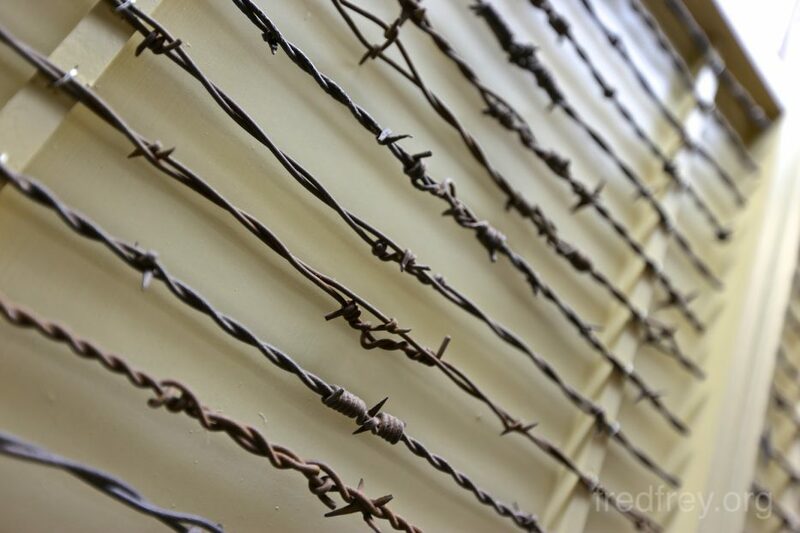 The Devil’s Rope museum is another one of the odd museums that line the route. 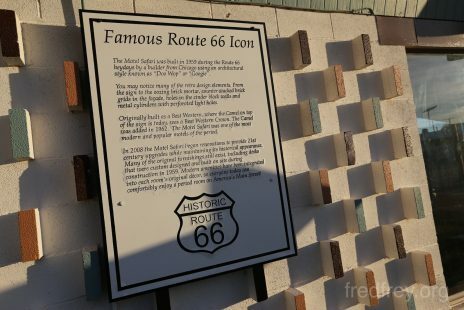 As usual we expected only a few displays but were surprised with the vast amount of presentations available to us for a very reasonable $5 charge. 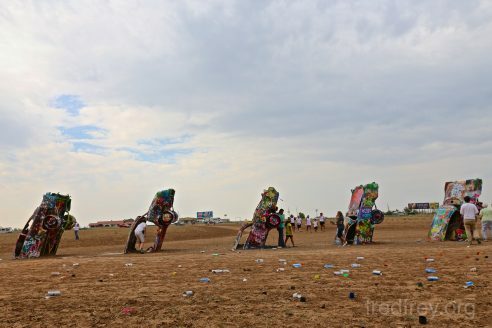 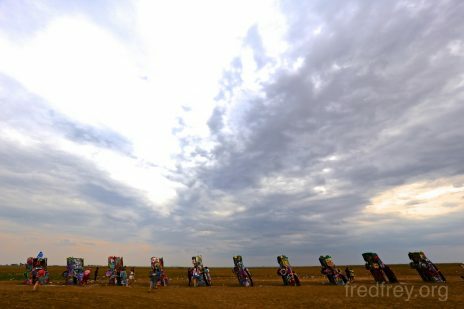 The Slug Ranch is the poor mans answer to the more famous Cadillac ranch. 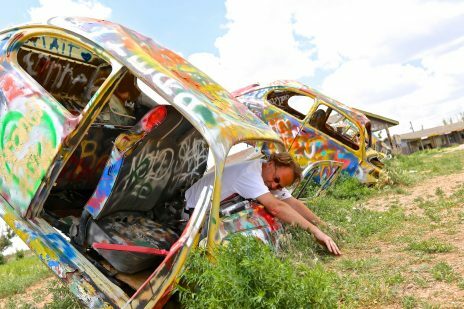 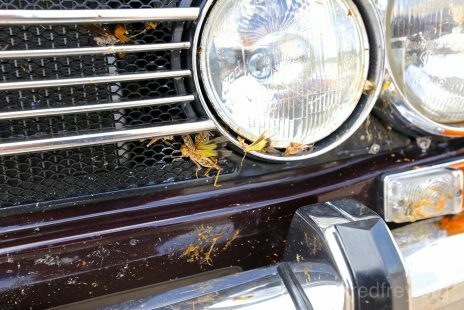 Not nearly as famous, this display of half buried VW Bugs is in a desolate area of 66 is worth it simply for the lack of tourists blocking your photos. 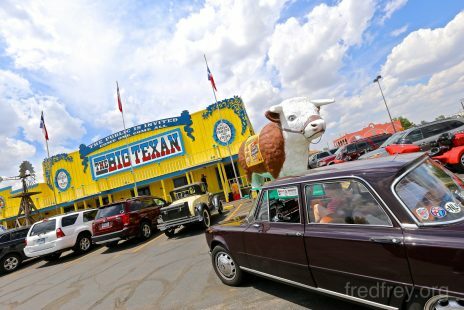 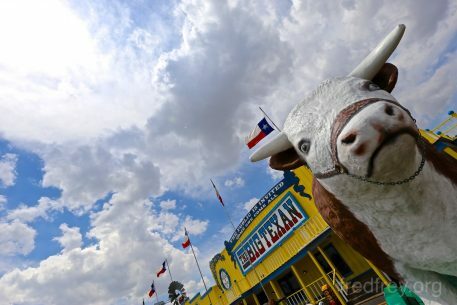 Our beer/food break for the day – The Big Texan. 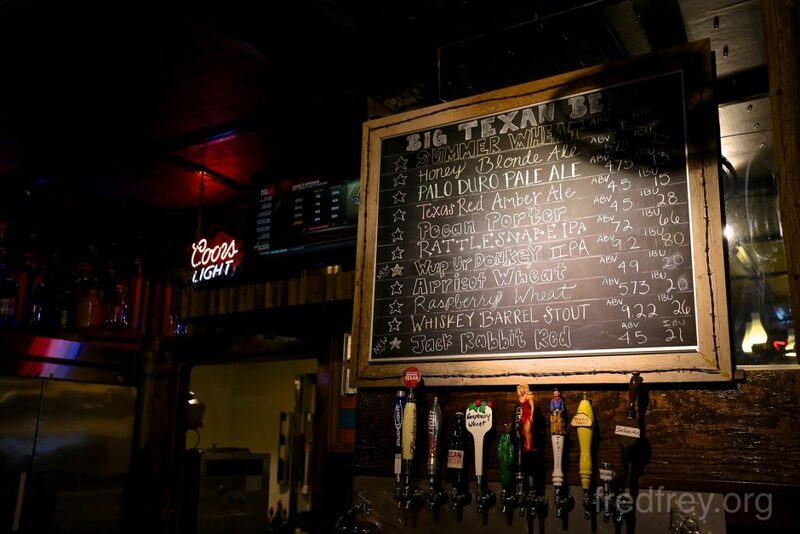 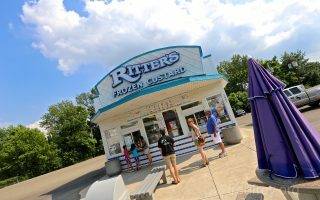 Best known for their free 72oz steak (if you finish it) and now craft beer. 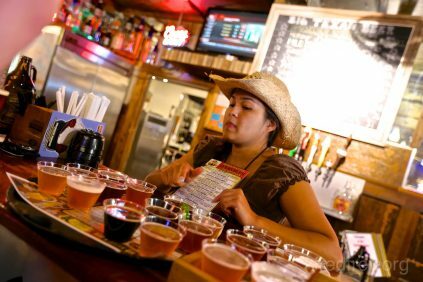 We saw a few taps and asked for a sample of everything. 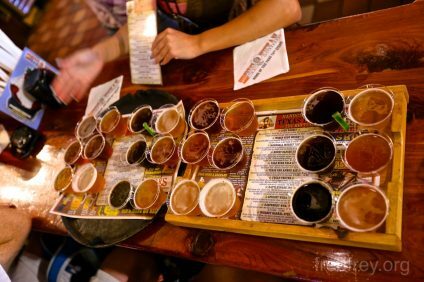 We discovered they brew 12 beers! 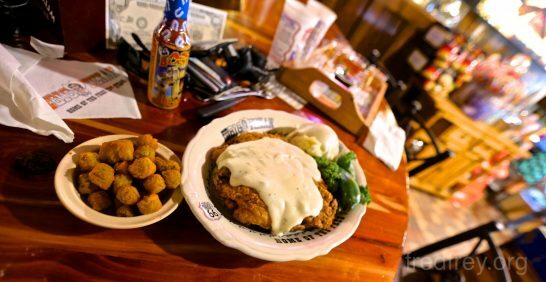 So, things are a bit blurry after this “meal”. 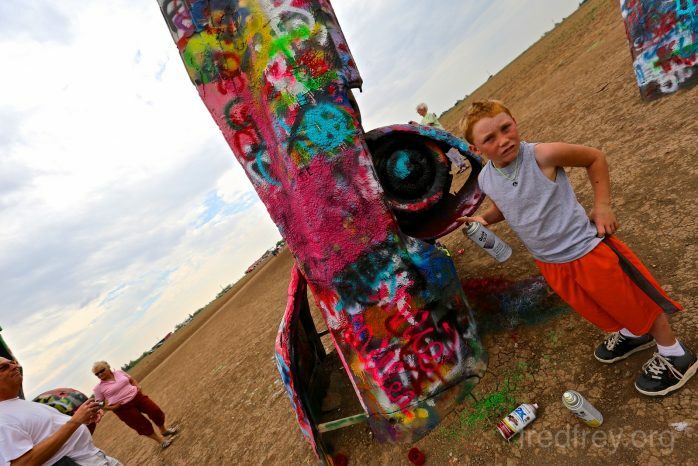 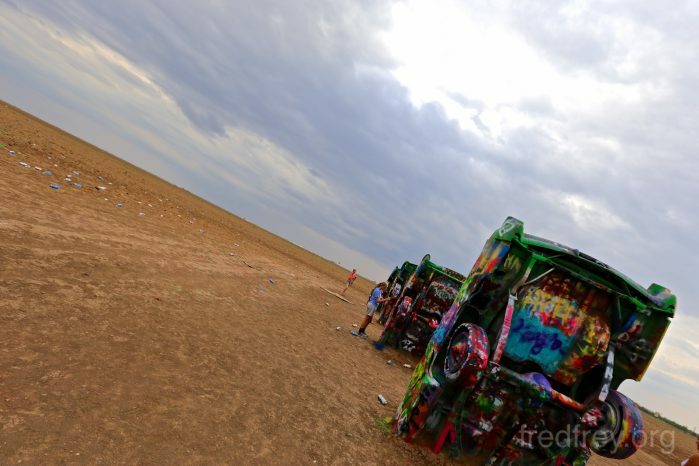 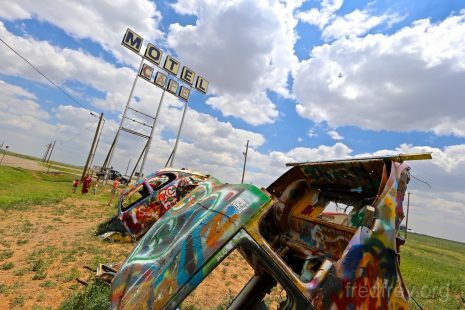 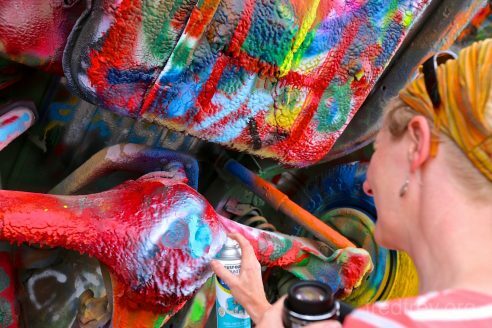 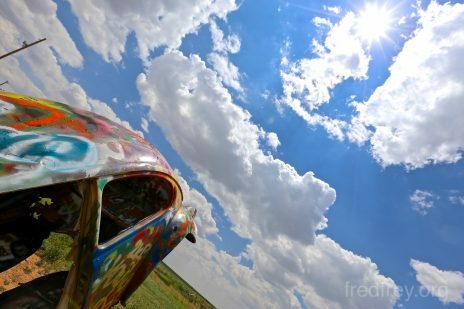 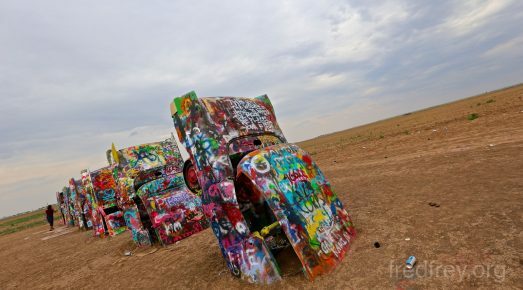 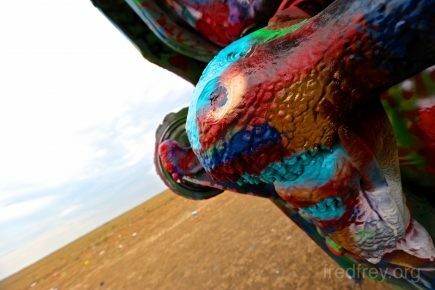 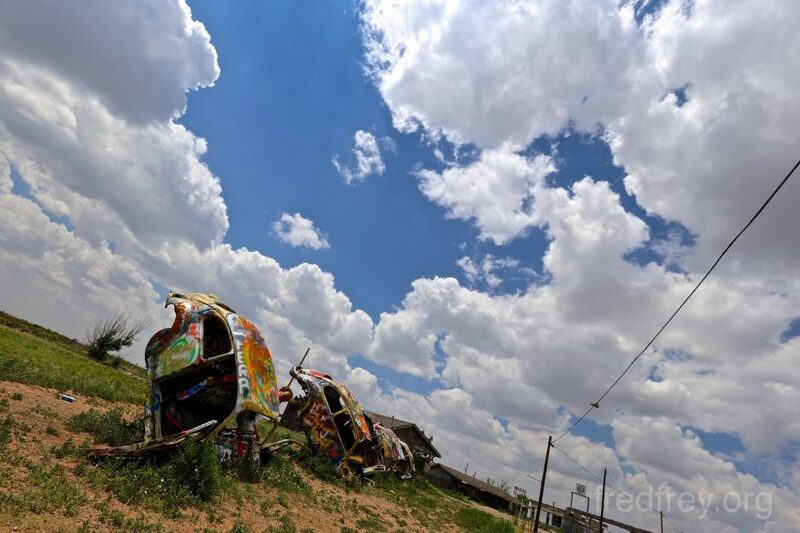 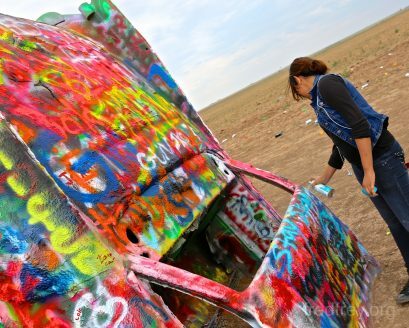 This must be the reason we found ourselves on a dirt road seeking the Cadillac Ranch. 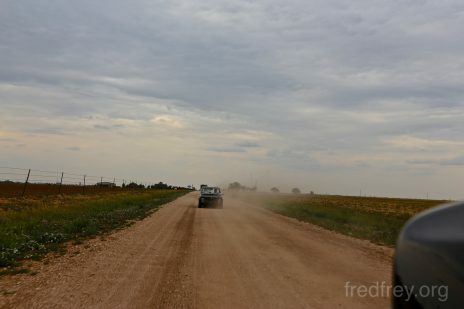 Obviously there was a paved way to get there but we did not find it. 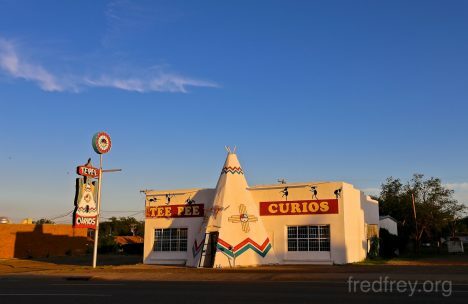 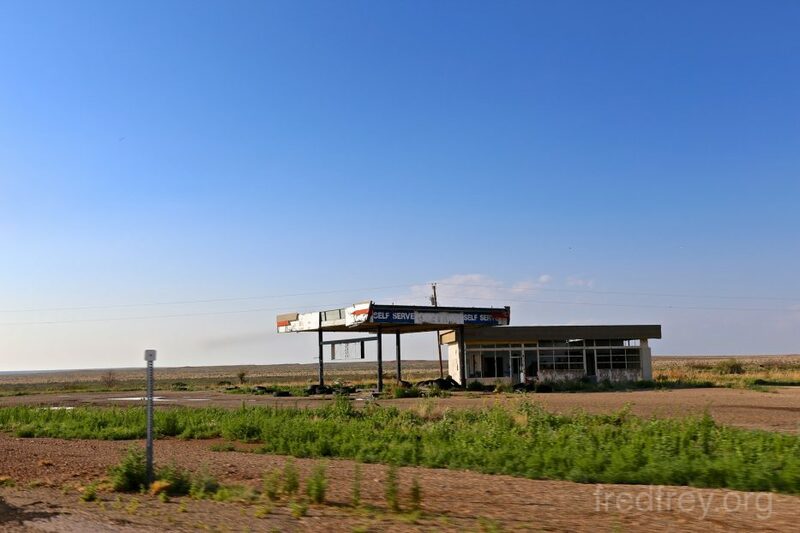 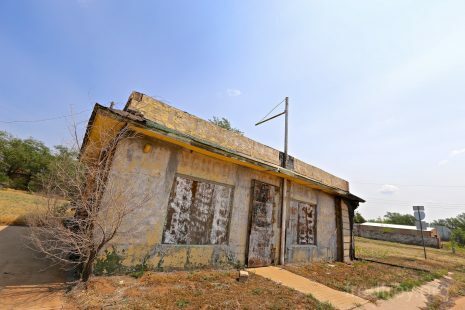 Close to our stop for the night in Tucumcari, we discovered another “ghost town”. 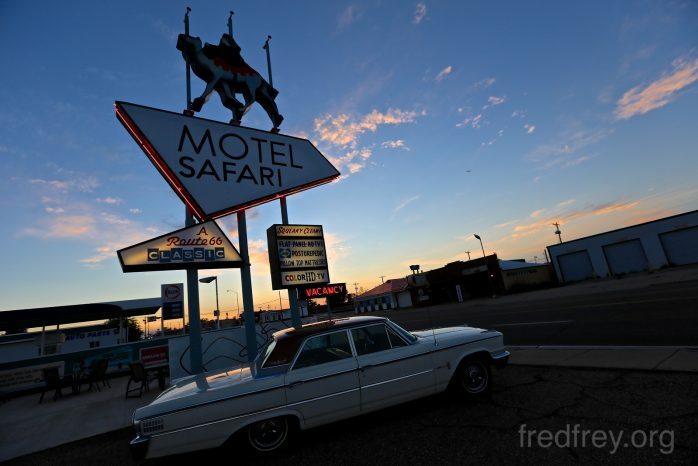 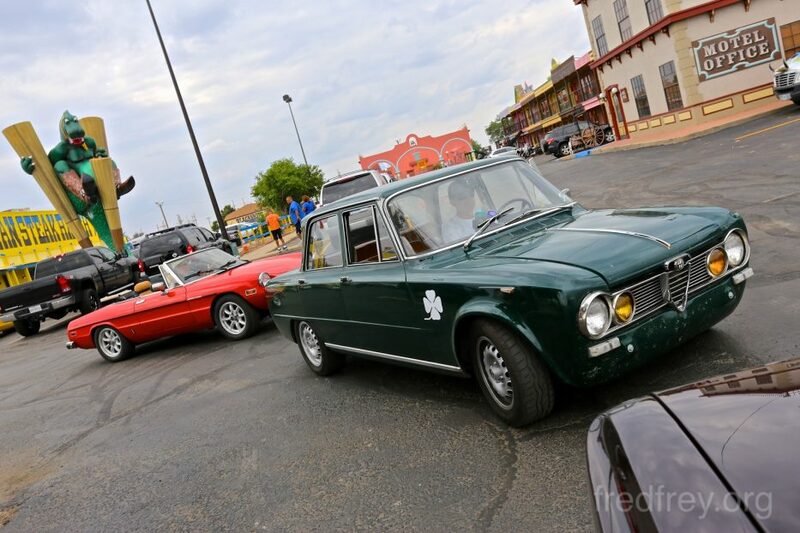 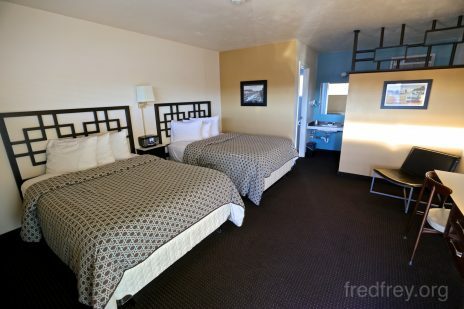 This one seemed to have an occupant so we made a quick exit to our hotel for the night – Motel Safari in downtown Tucumcari, New Mexico. 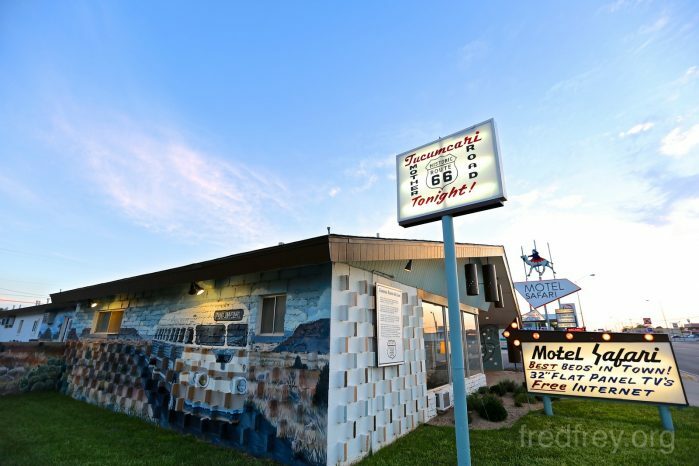 A city made up of gas stations and motels – with most of them now closed and crumbling. 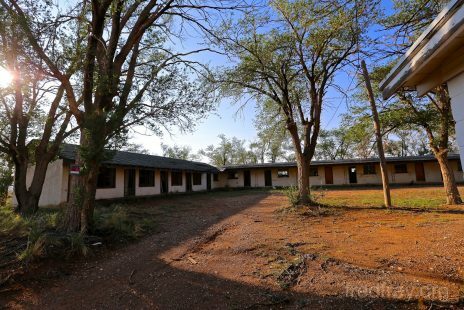 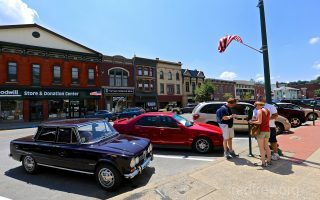 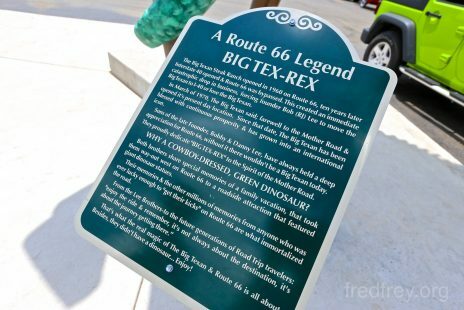 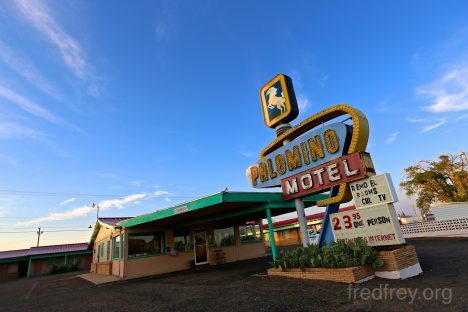 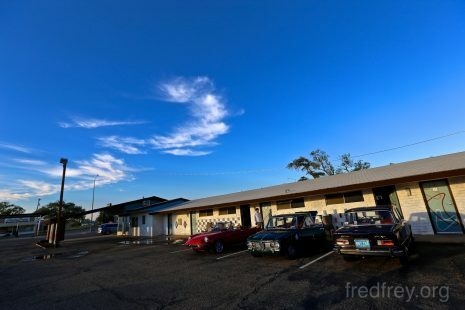 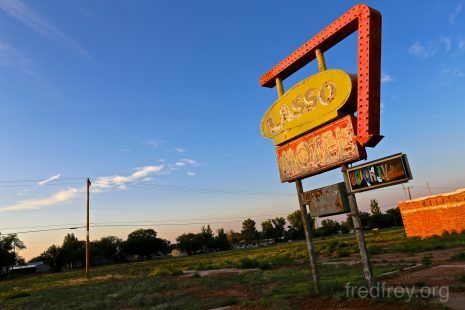 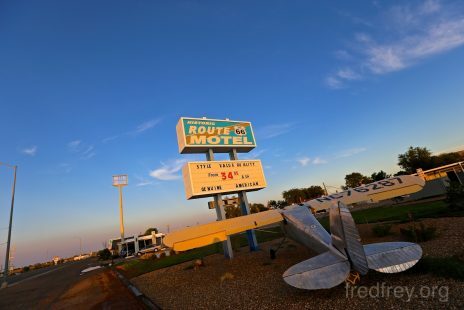 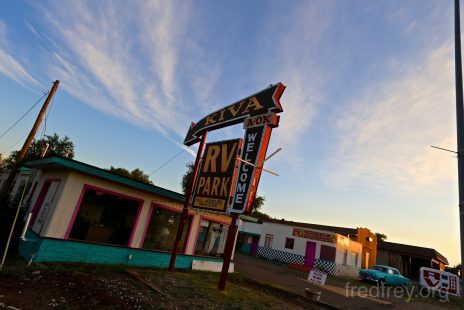 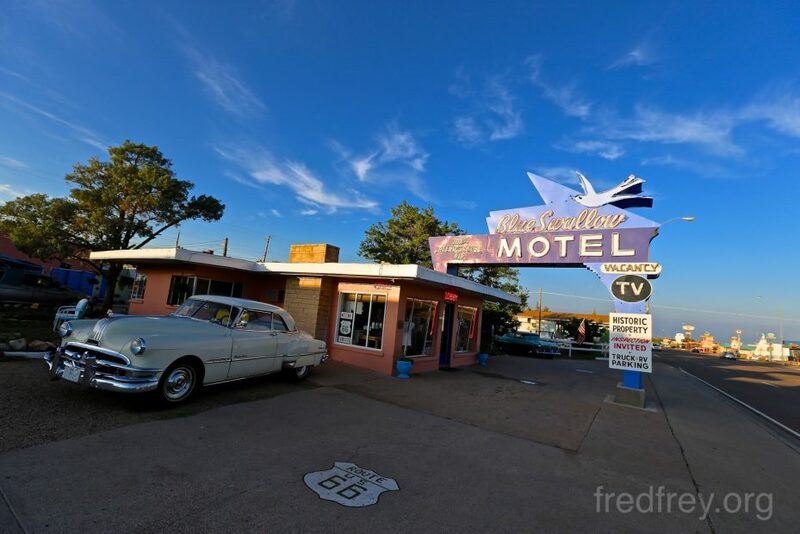 This is a favorite town of 66 travelers as a few of the old motels have been restored. 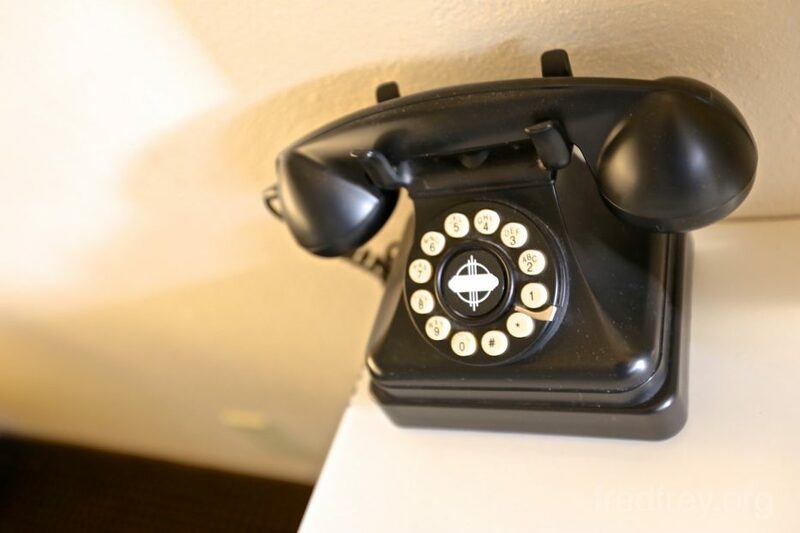 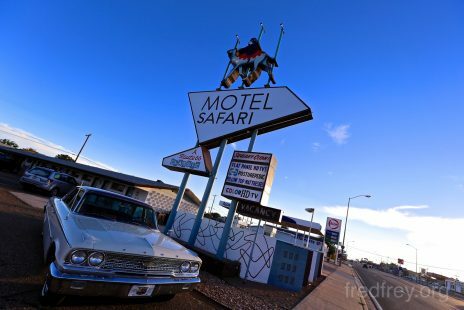 The Blue Swallow is the most famous but is usually booked – we stayed at Motel Safari: clean, friendly and very historic as well.